Anyone who fishes commercial carp waters will know that islands are a prime area to target for good carp weights. Float fishing is almost impossible due to the amount of line hanging underneath the float - this can catch in overhanging vegetation, so the only effective way to fish tight to an island is to use a feeder rig set up. 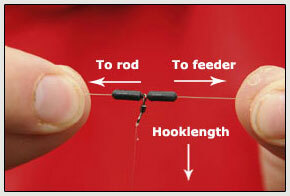 Here we show you one of the very best feeder rigs to use when fishing tight to an island feature, in a handful of easy-to-follow steps to make sure you can easily create this rig. It's worth bearing in mind the style of feeder used here - it's a cage feeder. These feeders are the best choice to use in shallow water around an island as the large holes in the sides allow water to enter rapidly, therefore the attractive groundbait inside escapes quickly to leave a cloud of scent in the water.